Bravo to all those who joined us at the AHA Center in Morristown, NJ this past Tuesday evening. We understand now that whatever we can Imagine we can Create. Everything is possible. Beyond the doubting ego lies the heart of clarity, honesty and appreciation. This is where the truth of the illusion breaks down and reveals the truth of the divine mystery.We are the Manifested Transformation embracing the New World, the New Ideal, the New Self. Thanks again to all of you. Thank you for sharing such fantastic, awesome and REAL insights!!!!!!!!! I so Loved this, Loved this, LOVE this!! Totally resonated with me for sure. I felt so many confirmations to what Robert brought forward the other night!! Thank you again for sharing with people who are ready to receive and move us forward into what is to be!!!! Debbie, thank you for your inspiring and aspiring comment. 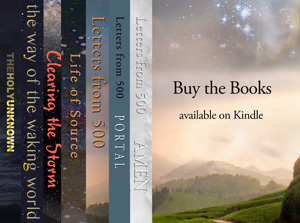 The message that awaits readers of Letter from 500 is a connection with the balance of the universe. There is no specific path to follow here, no religion, no cultist affectation. This message lies obscured inside each and every being’s heart center waiting for something to pierce through the veil. Perhaps this is the one, as it seemed to do for you. Robert and the messages he transcribes holds no ownership on the truth. We all know what is needed to progress forward into a new world. Sometimes we need a little reminder. Thanks again for the words of confidence and we look forward to more comments from you.